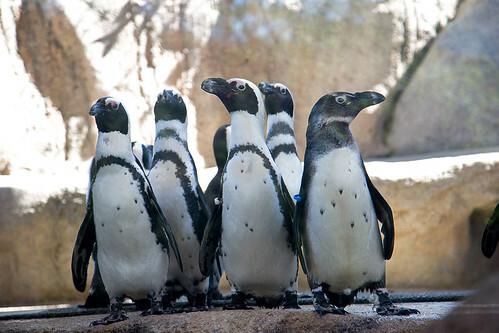 African penguins are a smaller penguin species, standing about 18 inches tall and averaging 7 pounds. Males are slightly larger with heavier bills than females. 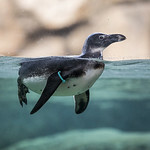 Like all penguin species, they are a marine diving bird with strong, flipper-like wings, heavy, solid bones, webbed feet (black in this case) and dense, overlapping feathers. 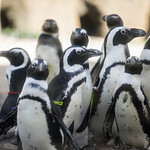 African penguins are a banded species with a horseshoe-shaped, white band of feathers around the sides of their head and chin and a black band across their chest. Juveniles have gray-blue feathers that darken to black within three years. The only penguin species that breeds on the African continent, African penguins inhabit a coastal range from South Africa to Namibia. They live in large colonies on offshore islands and at three protected beach sites—two in South Africa, one in Namibia. Endangered. Competition from commercial fishing and oil spills are the primary, human-caused factors threatening their survival. In past decades, egg collection and removal of guano (used for nest burrows) also contributed to the population’s decline. African penguins breed and nest in burrows, rock crevices and under shrubs on rocky and sandy shoreline. 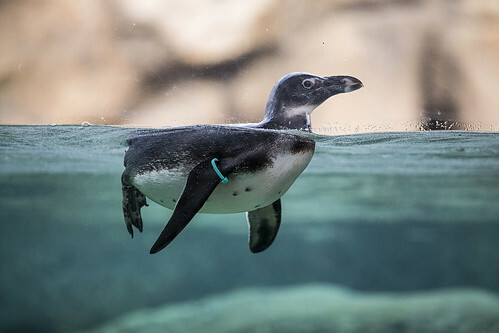 African penguins prey on anchovies, sardines and other small, shoaling fish supplied by the Benguela Current, a cold, nutrient-rich ocean current that follows their native southwest coast of Africa. They also feed on squid and crustaceans. Commercial fishing, however, has diminished their prey population and threatened their survival. Adults don’t all breed at the same time, so colonies include eggs and chicks at various stages of development. Mating penguins often remain together for years. Females lay two eggs on average. The incubation period is about 40 days, with the male and female participating equally in the incubation duties. Adults guard chicks until they are about 30 days old, after which both parents can forage at sea simultaneously. Chicks that are left alone often form creches to defend against attacks from adults and other predator species. Chicks fledge from 60 to 130 days of age. Juveniles leave their natal colonies for 12 to 22 months, then return to molt into adult plumage. 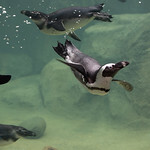 Strong, flipper-like wings propel African penguins forward in the water while webbed feet and tails act as rudders and help steer. Dense bones help penguins use less energy when diving for prey. Tongues and palates are covered with stiff spines that point backward to grip prey and move it along. African penguins use their black-and-white plumage, called “countershading,” as camouflage when hunting fish or evading predators. Dark feathers on their backs are difficult to see underwater from above; pale front sides blend in with the lighter surface of the sea when viewed from below. African penguins have patches of exposed skin near their eyes. Blood cools as it circulates through this area. On hot days, more blood circulates and the patch becomes pinker. They also have special muscles that push their feathers outward, releasing trapped heat. Experience the zoo from the inside with penguins waddling right at your feet! 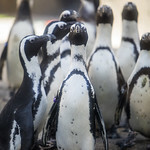 Get a personal introduction to some of the African penguins living at Pritzker Penguin Cove, and find out what their daily lives are like both at the zoo and on the southern African coast. African penguins flourish along the temperate southern coastline of the African continent thanks to special adaptations suited to a life at sea. 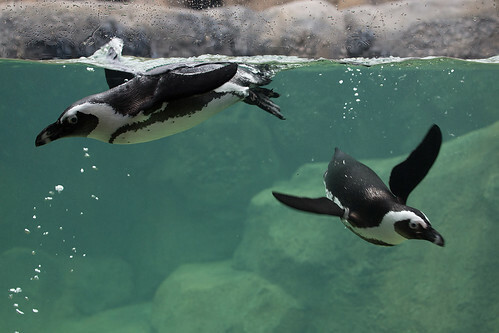 African penguins may be flightless above ground, but they “fly” up to 12 miles per hour underwater. Strong, flipper-like wings with fused bone structures propel their torpedo-shaped bodies forward while large, webbed feet and tails act as rudders and help steer. Penguins have an extremely high feather density. Short, lance-shaped and overlapping like roof shingles, feathers provide superb insulation in water and on land. Penguins waterproof them by using their beaks to apply an oily substance secreted from a gland at the base of their tail. 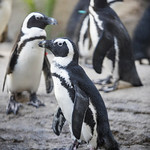 African penguins use their black-and-white plumage, called “countershading,” as camouflage when hunting fish or evading predators such as great white sharks and fur seals. Dark feathers on their backs are difficult to see underwater from above; pale front sides blend in with the lighter surface of the sea when viewed from below. Bones denser and heavier than those of other birds help penguins use less energy when diving deep for fish, crustaceans or squid. They swallow prey underwater, using a tongue and palate covered with stiff spines that point backward to grip prey and move it along. Unlike their Antarctic relatives, African penguins can overheat in their warmer, temperate climate. One way to cool down is to simply dive into the ocean. 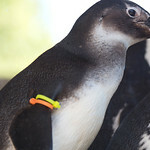 But African penguins also have bare patches of skin on their faces where blood circulates to dissipate heat. Additionally, they have special muscles that push their feathers outward, releasing trapped heat. African penguins have a more varied diet than penguins in more southern latitudes that mainly feed on krill, a shrimp-like crustacean. The Benguela Current—a cold, nutrient-rich ocean current that follows their native southwest coast of Africa—supports a rich ecosystem of marine life, including dense schools of anchovies, pilchards and sardines that African penguins prey on. They supplement this primary food source with crustaceans and the occasional squid. This food supply, however, has been diminished by commercial fishing—a human activity that threatens the species’ survival. 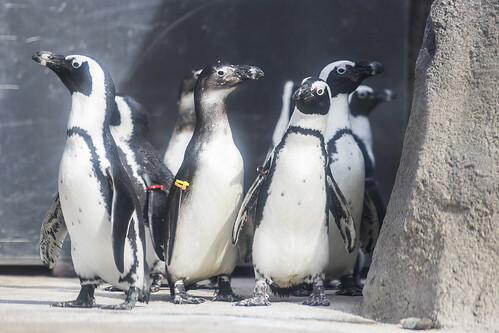 This slideshow features some of the fish fed to the zoo’s African penguins. There are 17 species of penguins, but only two of them—the emperor and Adélie—spend their lives on ice. Penguins evolved in temperate climate zones, and today most species still inhabit ranges more temperate than polar. From banded to brush-tailed to crested, little to large, they are spread throughout the Southern Hemisphere from the tropical Galapagos Islands to Antarctica’s frigid Ross Sea. The only penguin species that breeds on the African continent, African penguins inhabit a coastal range from South Africa to Namibia. They live in large colonies on offshore islands and at three protected beach sites—two in South Africa, one in Namibia. They are commonly called jackass penguins for the loud, donkey-like bray individuals use to communicate. Native to the Galapagos Islands along the equator west of Ecuador, the Galapagos penguin is the northernmost-living of all penguin species. It’s also one of the smallest, which helps it dissipate heat more easily in its warm, tropical habitat. The birds nest in volcanic cavities and caves to protect eggs from predators and the sun. Human disturbance of this once-isolated ecosystem and an unpredictable food supply caused by climate change-related El Niño weather cycles have shrunk its population to one small colony of fewer than 2,000 individuals. Magellanic penguins nest on sandy beaches and rocky cliffs along the southern coasts of South America, where colonies can number up to 200,000 individuals. During non-breeding seasons this migratory species will follow ocean currents (and squid and small fish) from temperate to more tropical zones. 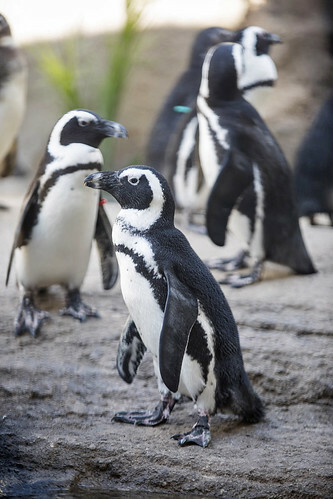 Like other banded penguins (including African penguins), it sports black-and-white stripes on its head and chest that are thought to startle fish away from protective schools. 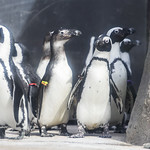 Humboldt penguins get their name from the Humboldt Current, a cold, nutrient-rich oceanic upwelling along the Pacific coasts of Chile and Peru, where large colonies feed on garfish, anchovies, pilchards and squid. The species is known for its strong sense of smell, an adaptation thought to play an important role in family and social bonding behaviors. Rockhopper penguins burrow and nest in high grasses on rocky island coasts. Divided into three subspecies— southern, eastern and northern—they’re the most numerous penguin species, scattered across Southern Ocean islands from the Falklands to New Zealand and feeding primarily on krill. A so-called crested penguin, these small birds sprout bright yellow plumes on the sides of their head and have small, red eyes. These small crested penguins spend most of their lives in the open ocean—so much so that barnacles can attach to their tails. They breed beneath chilly rainforest canopy on the southwestern coast of New Zealand’s South Island. Secretive and solitary, pairs hide their nests in caves, dense shrubs, under logs and between tree roots and are active only at night on land. Invasive weasels and cats have decimated their numbers to fewer than 3,000 pairs at last estimate. Closely resembling Fiordland penguins, these small crested penguins live south of New Zealand on Snares Island, a protected marine sanctuary—and the most restricted of all penguin ranges. They nest beneath temperate forest canopy and on coastal rock. More social than Fiordland penguins, they live in dense colonies and feed mostly on krill. The world’s smallest penguin—native to Australia’s southern coast and New Zealand—measures 16 inches from beak to tail, weighs less than 3 pounds and swims at a leisurely 1 mile per hour. Also called little blue penguins, their heads and backs are pale blue to dark gray-blue. The most nocturnal of all penguins, they come ashore at dusk and leave before dawn to hunt all day for sardines and anchovies. 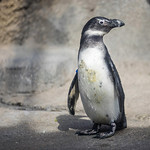 Distinctive for its yellow eyes and yellow eye-stripe plumage on adults, the yellow-eyed penguin is the largest penguin outside the Antarctic. Native to the southern islands of New Zealand, these sedentary birds spend most of their time on land in coastal forests, hunting close to shore for opalfish, cod and mollusks. Highly endangered, their population has declined due to invasive predators and pets. Macaroni penguins have a circumpolar range including at least 50 islands in the south Atlantic and southern Indian oceans. Breeding in huge colonies that can exceed 2 million birds, individuals often must walk long distances over rocky terrain to reach the same rock-lined mud-hole nest site—and same mate—every year. This crested species feeds almost exclusively on krill. Royal penguins closely resemble macaroni penguins except for their faces, which are white instead of black. They breed exclusively on Macquarie Island between New Zealand and Antarctica, building nests lined with grass and small stones. Little is known about where they migrate outside of breeding season, but their diet consists mainly of krill and other invertebrates. Distinguished by crests of upright yellow feather plumes, this little-studied penguin species breeds on the isolated Bounty and Antipodes islands south of New Zealand. Its confined range is the likely cause of its steep population decline over the past 50 years. Eggs are laid on rocky slopes without nesting materials, often alongside rockhopper penguin colonies. Chinstrap penguins are named for the thin dark line running below their chins. Their colonies number in the millions around the Antarctic Peninsula on South Georgia, South Orkney, South Shetland and South Sandwich islands—between Adélie penguins to the south and gentoo penguins to the north. They build nests from stones and are informally known as “stone-cracker penguins” for their high-pitched calls. Gentoo penguins have a circumpolar range across many islands ringing Antarctica. 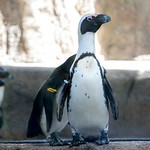 Along with the chinstrap and Adélie they’re known as brush-tailed penguins for their long tail feathers. These stout birds also have white, wedge-shaped patches around and behind their eyes. They build nests from small pebbles more than 300 feet above the shore to prevent flooding from melting snow. The world’s biggest penguin—more than 3.5 feet tall and up to 84 pounds—is one of nature’s wonders. About 30 colonies live on the Antarctic continent, where they breed during the winter. Huddling males balance incubating eggs on their feet in near darkness for two months while female mates trek more than 60 miles to the ocean to feed. Males can briefly secrete a milk-like substance from their esophaguses to feed chicks if they hatch before females return. These endurance athletes can also make 600-mile foraging trips and dive to depths as great as 1,500 feet for fish and squid. Resembling emperor penguins, king penguins sport spoon-shaped orange spots on the sides of their heads and long, slender beaks with dark orange stripes along the lower mandible. The second largest penguin, they’re nearly as tall as the emperor but half as heavy. Residing in dense colonies on many islands encircling Antarctica, they don’t build nests and have one of the longest breeding cycles of any bird: 14–16 months to fledge a single chick. No other bird on Earth breeds further south than the Adélie penguin. The smallest of the Antarctic penguin species, these short, wide birds live in large, highly social colonies on continental shores and nearby islands—particularly the Ross Sea area. Adélie penguins can rocket from the water onto land without slipping, often travel by sliding on their bellies and grip the icy terrain with powerful claws—adaptations that serve them well in their extreme environment. They can be identified by white eye rings. 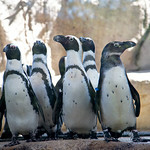 Learn more about African penguins... and test your knowledge! Penguins only live in Antarctica. Penguins are also found in South America, Africa, New Zealand and Australia and on many islands surrounding Antarctica. Only two of the world’s 17 penguin species—king penguins and Adèlie penguins—spend their entire lives on the Antarctic continent. African penguins are the only penguins that live in Africa. African penguins are the only penguin species that breeds in Africa. They inhabit more than 20 islands and three mainland beach sites along the southwestern coast of Africa in Namibia and South Africa. Only female African penguins incubate eggs. Both male and female parents help incubate eggs. They both have a bare patch of skin, called a brood patch, which transfers their body heat more efficiently to the eggs as they incubate. African penguins are colonial breeders. They gather in groups called colonies that can include thousands of breeding pairs. Pairs are monogamous, often for many years, and return to the same nest site each year to build nests in burrows made from rock, sand or vegetation. Penguins use their bills to spread an oily substance, secreted by a gland near the base of the tail, all over their bodies. They preen themselves and each other to help maintain this waterproof layer. 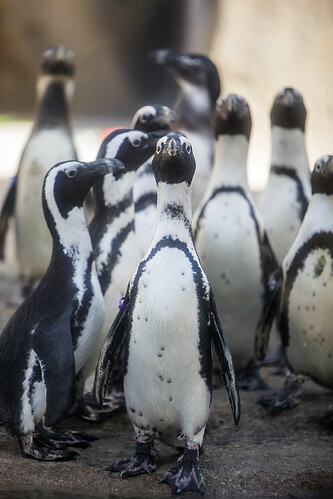 African penguins make a call that sounds similar to a donkey’s bray. African penguins are commonly called jackass penguins for the loud, donkey-like calls individuals use to communicate. “Yells” are used to defend territory. “Brays” are used between mating partners or to attract a mate. “Haws” are used by mating partners separated between sea and land. Penguins use camouflage to protect themselves from predators. African penguins use their black-and-white plumage as camouflage when hunting fish or evading predators. Dark feathers on their backs are difficult to see underwater from above. Pale front sides blend in with the lighter surface of the sea when viewed from below. African penguin populations have increased over the past 20 years. 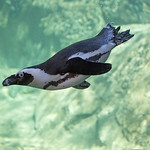 The population of the African penguin has declined to the point where the species is considered endangered in the wild. 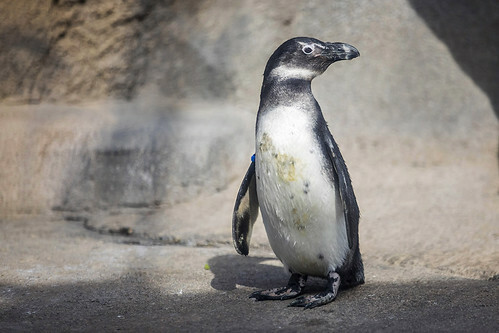 The Association for Zoos and Aquariums (AZA) has named the African Penguin one of their SAFE species. 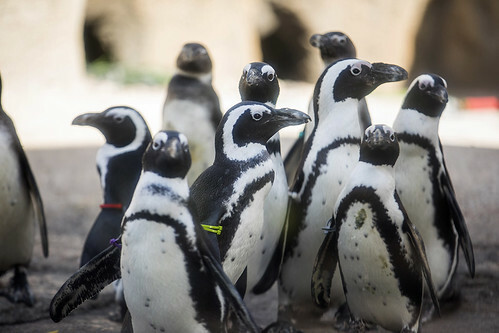 AZA zoos are working with conservation partners in South Africa to develop an African Penguin Biodiversity Management Plan. 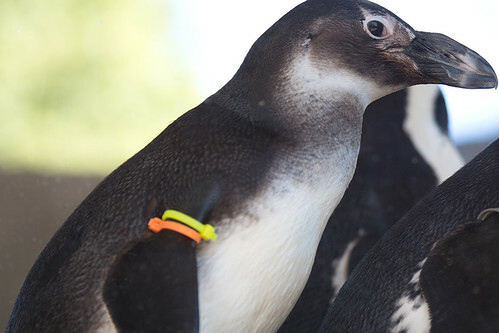 This initiative aims to support African penguin recovery by monitoring migration patterns, designing artificial nests, preventing disease outbreaks and more. 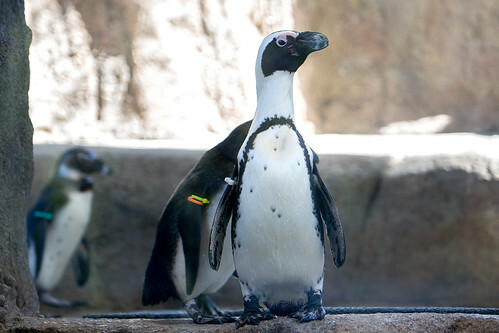 The Robert and Mayari Pritzker Penguin Cove reflects African penguins’ native home, from burrow-like nest boxes to coastal waters. 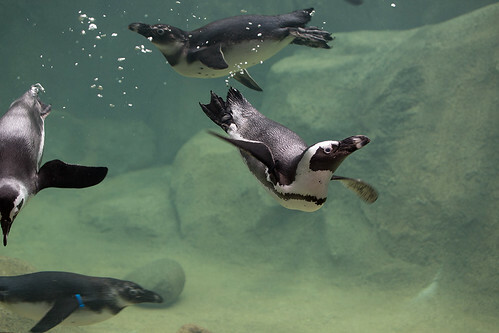 Check out the exhibit highlights that make our penguins feel right at home. The beach area features a variety of substrates for the penguins to enjoy. Artificial mats provide cushioned comfort and airflow for good foot health. Loose river rocks can be used as nest material or comfortable places to stand. The pool deck is sloped to simulate the lapping of water onto the beach where pebbles and stones are embedded. Nest boxes designed to emulate the burrows African penguins lay their eggs in are available 24/7 to breeding pairs in the colony. They’re located behind the scenes, but some of their entrances are visible to visitors. Radiant heat beneath the deck keeps it ice-free during winters, which get a bit cooler in Chicago than South Africa’s more temperate climate. The extra warming helps Animal Care staff and—although they’re more surefooted on slick surfaces—penguins access the deck and pool year-round. The pool is equipped with special gear that circulates water through a filtration system. A heating system keeps the water at a perfect temperature for swimming penguins throughout the year. Artificial kelp underwater provides extra enrichment to encourage natural behaviors. Visitors enjoy close-up views through huge glass windows that form one side of the exhibit. 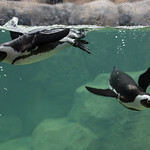 The split-level perspective provides immersive views of penguins swimming underwater and socializing on land. Fish are stored and thawed in a behind-the-scenes kitchen equipped with a freezer, cooler and food-prep area. Zookeepers prepare herring, anchovies, silversides, capelin, marine smelt and trout for the penguins. All of the penguins are hand-fed by zookeepers. Daily portion sizes and fish preference vary from bird to bird. Zookeepers carefully record feeding patterns to help zoo nutritionists fine-tune individual diets. What do the penguins see from the heart of their exhibit? 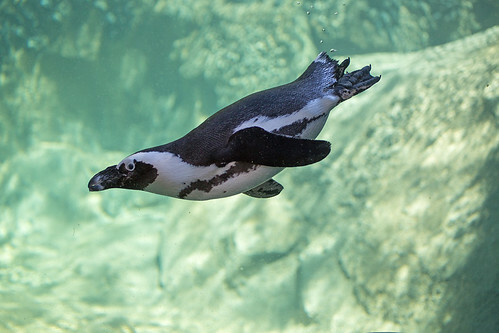 Pretend you’re a penguin—drag the screen to get the African penguin point of view!